Thais are simply passionate about eating and there's no better place where Thai food is the center of attention like Bangkok! The city brings together food from around the country into a melting pot of amazing tastes everywhere you look. 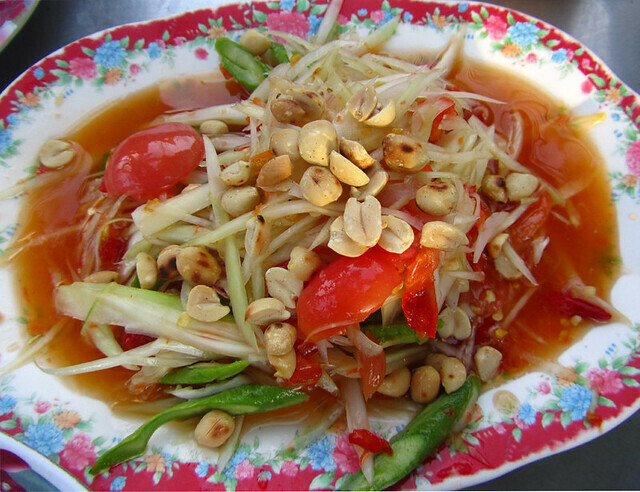 Among the giants of popular Thai dishes is som tam, or green papaya salad. The green papaya is sliced thin and pounded with an assortment of ingredients and chilies and dressed with fish sauce and lime juice. Som tam is best enjoyed with a plate of sticky rice to dip into the dressing. 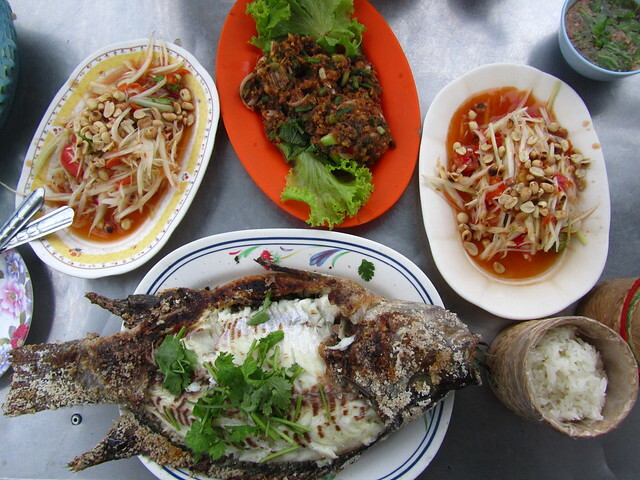 Where To Eat It: Everywhere on the streets of Bangkok, but if you are looking for a restaurants you can try Som Tam Boo Maa, one of my favorite Isaan restaurants in Bangkok. Larb moo is a minced pork salad that goes great with an order of som tam and a pile of sticky rice. Minced pork is cooked and mixed with fresh herbs, toasted rice, and flavored with fish sauce and lime juice. Larb can also be made with other meats like chicken (gai), beef (larb neua) or catfish (larb pla duk). Where To Eat It: All Isaan restaurants throughout Bangkok. If a local Thai doesn't know what to order, the always delicious standard to rely upon is pad ga pao moo – stir fried pork with basil. Usually the dish is served over a plate of plain rice and an optional fried egg (kai dao) on top. Can also be ordered with seafood (tale), shrimp (goong), or chicken (gai). Where To Eat It: Find pad ga pao in every little nook and cranny street stall in Bangkok. I used to eat quite often at Poisien restaurant (aka Pumpkin lady restaurant) near Victory Monument. There are quite a few famous Thai curries available, but one of the best is gaeng keow wan gai or green chicken curry. The curry is made with fragrant green chili paste, chicken, bamboo shoots, and a host of other ingredients that blend together. Finally coconut milk is added to make the sauce creamy rich and bring the spices together. Where To Eat It: Not so much on the street side, but at most neighborhood or Thai sit down restaurants. 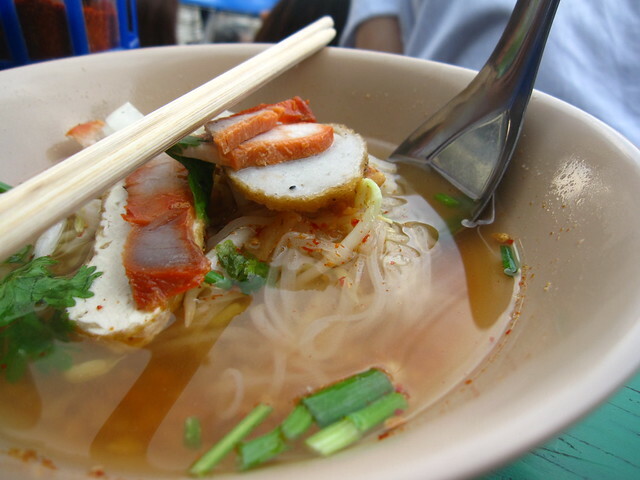 If you're tired of rice, Bangkok offers an abundance of noodle dishes as well. 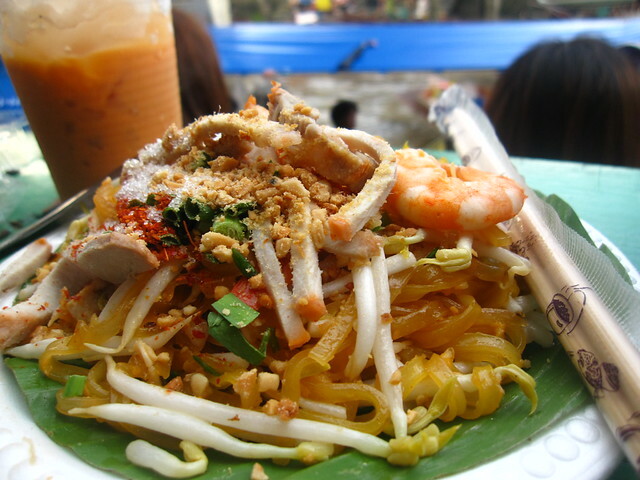 The all-time world famous dish of Pad Thai is available throughout Bangkok. Rice noodles are stir fried with slices of tofu, bean sprouts, eggs, and possibly shrimp. The noodles are sprinkled with chili flakes and a squirt of lime before being served. Where To Eat It: Anywhere you see a pad Thai stall, or at some neighborhood hole in the wall restaurants. Literally translated as “stir fried dunken noodles,” pad kee mao is a greasy dish of wide rice noodles. The noodles are fried with a handful of vegetables and choice of meat and salted with fish sauce and soy sauce. As the name suggests, these noodles are great after a night out! Where To Eat It: Most stalls in Bangkok that serves stir fried dishes. Noodles flash boiled and combined in a spicy sour soup broth is about as easy, fast, and popular is it gets for Bangkok street food. Many Thais choose to personally add a spoon of sugar, some extra chili flakes, and a spoon of vinegar to give the noodles an extra burst of flavor. Where to eat it: Everywhere you see a noodle soup cart, you'll be able to order their version of kuay teow tom yum. If you are further interested in Thai food, I'd recommend taking a look at the Eating Thai Food Guide, the ultimate guide to discovering, ordering, and eating Thai food. The street brewed local moonshine whiskey of choice throughout Bangkok is known as Yadong. Where To Drink It: You can locate vendors selling Yadong in big glass jars usually with red lids, available on the side of streets. It's best to bring your own bottle or fill up an empty energy drink bottle. Prices can range from 10 – 100 THB for a bottle of Yadong. Thai iced tea, known as cha yen, is a sweet milky tea that goes down well when it's hot and sweaty outside. 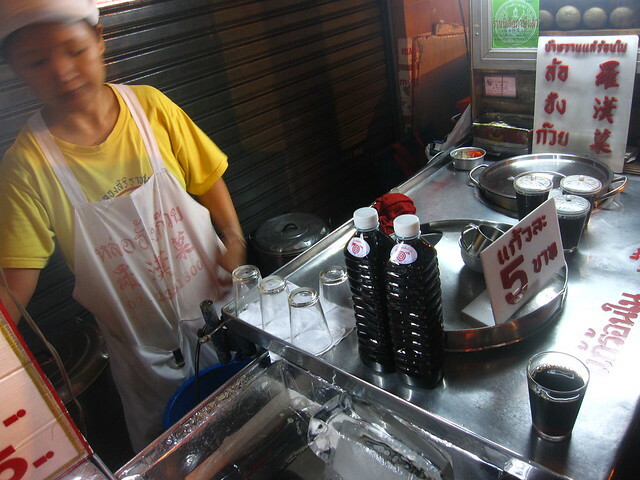 Where To Drink It: Any drink stall in Bangkok, you'll see cans of carnation condensed milk at the cart. Be aware that a lot of Thai drinks are made extremely sweet and even fresh juices are sweetened up with sugar. I used to not be a real fan, but after walking around and sweating all day, a shot of sweetness can be welcomed. Where To Drink It: Many carts throughout Bangkok that squeeze juice and make fruit shakes. 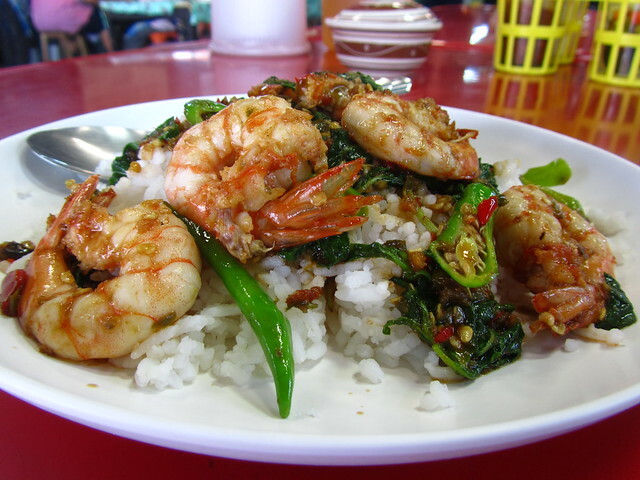 If you are interested in Thai food be sure to check out the ultimate Eating Thai Food Guide.